Payday loan company Wonga has removed pages from its website after it was branded "incredibly irresponsible" for targeting students. However the lender said it would still accept applications for short-term loans from working students. 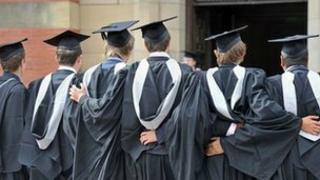 The National Union of Students (NUS) said it was wrong for the company to push the loans - with a typical APR of 4,214%. An official study said that these loans could prove useful for some people. Wonga replaced an article on its website about short term loans for students with a statement saying the previous article was out-of-date and "gave rise to misunderstandings." The company said the original article was written as part of a strategy to make its services easier to find on internet search engines. Promoting such loans to students had prompted a flurry of protests on Twitter. Customers of payday loan firms would typically borrow a few hundred pounds from a payday loan firm for a short time, then pay it back when they receive their next slice of income. The industry is regulated, but there has been some criticism of the cost of these loans. The NUS had criticised marketing that had been on the Wonga website which promoted the loans for occasional emergencies or unexpected events. The website suggested that official student loans can encourage people to live beyond their means. The APR is a standard way of showing the costs of borrowing, so you can work out which option is the cheapest. It includes the rate of interest, the term of the loan and any fees. All lenders have to tell you the APR before you sign an agreement - except overdrafts. "It is highly irresponsible of any company to suggest to students that high-cost short-term loans be a part of their everyday financial planning," said Pete Mercer, NUS vice-president. "Students should think long and hard before choosing payday loans over any other form of borrowing, including government-backed student loans. If students are struggling to make ends meet there is often other support available, and anyone worried about their finances should talk to their students' union or financial advisers at their university. "Wonga should immediately withdraw this predatory [offer], which contains information that appears to be inaccurate, and is aimed at financially vulnerable young people." In response, a spokesman for Wonga said that to get a loan students would need a regular income. "Our decisions about any students who do choose to apply are based on the same rigorous checks we perform on all applications, but we do not believe working, adult students should be excluded from a popular credit option," he said. He also denied that the company was "actively targeting" students. The Department for Business said that borrowers should be aware of the costs involved with any form of credit, considering their own financial circumstances. "The Office of Fair Trading (OFT) is clear that lending money to people who will clearly struggle to repay it, or where that product is clearly unsuitable for that individual is irresponsible," a spokesman said. The government believes that official student loans to eligible English students should cover their tuition costs, and contribute towards their living costs while at university. Despite the negative publicity surrounding payday loan firms, the OFT has said that payday loans and other high-cost credit businesses - such as pawn brokers or home-credit lenders - should not have their interest charges restricted.